The key to this recipe is definitely the bread. One of the most important lessons I hope people take away from this blog is that you must always read the ingredients label (if it is processed enough to have a label) before buying/eating anything. For years I bought my husband Arnold’s “Whole Grains” Health Nut Bread from the grocery store until one day we finally read the ingredients. If it only takes a handful of key staples to make bread (flour, water, yeast, salt) why did we find 40 items on the list? It was rather disturbing so we of course immediately made a switch and started buying our bread from a true bakery (and no, it’s not one of those so-called bakeries located in the grocery store…don’t let those fool you either). Our bread now only has 5 ingredients, and it is by far the best whole-wheat bread I’ve ever tasted. I’ve actually been toying with the idea of trying to make my own bread (with a bread maker of course), but I’m a little worried that it won’t be as good as what we get from Great Harvest! So making French Toast or not….please make sure you are at least starting off with the right kind of bread. Now that we got that out of the way you will not believe how easy it is to make this recipe. And don’t feel like you have to stick to the basics if you are in a creative mood. You could easily switch things up by cutting your bread out with fun cookie cutter shapes or even adding some extra flavor to the mix. I think adding a dash of nutmeg, some orange zest, or even a splash of Grand Marnier would really make this dish extra special. Also, don’t feel like this meal can only be served for breakfast…I actually made this French Toast for dinner last weekend, and as you can imagine it was a big hit! And if you have kids this is actually the perfect recipe for little helpers. Don’t stress about the raw egg factor, just let them roll their sleeves up and dig in. As you can see in the picture below both of my daughters eagerly prepped our bread for us. I barely had to do anything, and it was kind of nice! Cut the bread into desired shape (we made triangles). Whisk together the eggs, cream or milk, and vanilla in a shallow dish. 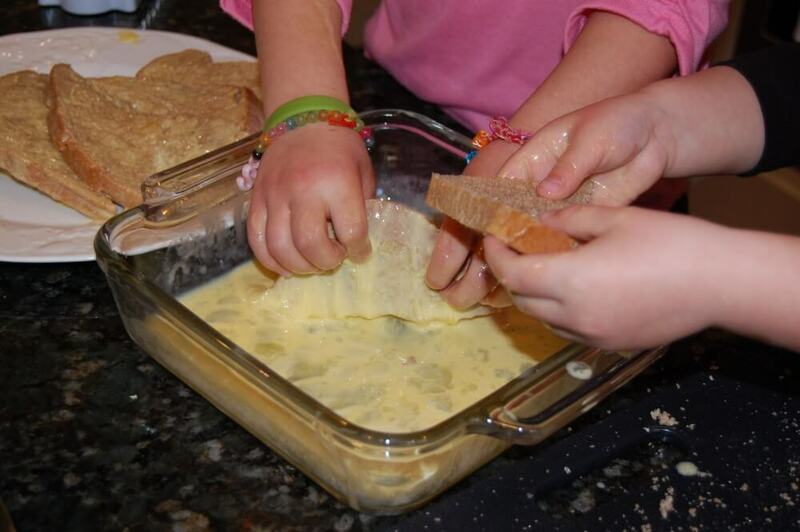 One-by-one dip the bread into the egg mixture until it is evenly coated on both sides. Let the excess run off before transferring the pieces to a plate. If you have a griddle turn it to 325 degrees F. If you don’t have a griddle don’t fret…any old sauté pan will do. If using a pan place it over medium heat. Melt a teaspoon or two of butter in your pan/griddle then add the first batch of battered bread. The key is for the finished product to be cooked all the way through by the time the outside turns brown so the heat should not be too high. Cook until golden brown on both sides. Add a little more butter for a second batch if necessary. Serve warm with pure maple syrup and a side of fruit. Enjoy! If you do end up trying a bread machine (I love mine…cuts the time in half), then check out Bed, Bath and Beyond..you can use one of the 20% off coupons. Thanks for the tip b/c I always seem to get those coupons from them! I got the breadmaker and I’ve tried several recipes but the family will not eat my homemade bread! I buy 100% whole wheat bread from the store but the homemade is better and healthier in my opinion. I feel like I’m fighting with them constantly on dropping the junk. It would be easier if my husband was on board but he’s not. Why do they refuse to eat real food?! Make sure you have a recipe with honey. A little honey goes a long way to sweeten the bread and make it more appealing to skeptical family members. Mine also calls for a little butter and a little dried milk. Not sure if that affects the taste, but my family enjoys my whole wheat bread. Good luck! I know it is frustrating trying to convert unwilling family members. Lauren – I am surprised to hear that! They really don’t think it is better? Have you gotten your husband to read any of the great books about real food out there or watch Food, Inc. with you? Would you share you recipe? I have a bread machine collecting dust in the garage, and am a die-hard Great Harvest fan. It’s not very convenient for me to get there, and of course they are closed 2 days a week! Honey Whole Wheat is my favorite, and I can’t imagine finding a recipe that tastes as good! (I will NOT put white/ap flour in my bread, and don’t agree that you must to get good bread. GH doesn’t use it, I don’t need to either!). I am so interested in what you make…? Hi, Angie. I agree that you do not need white flour to make it good – I don’t use any. I also love Great Harvest, nothing against them, but it is just easier and cheaper for me to make my own. Anyway, here is the recipe I’ve been using. I found it online and have altered it a little… It makes a 1/1.5 lb loaf. The wheat gluten supposedly makes the bread softer and hold together better. The research I did online about breadmaking seemed to suggest that using it is helpful. People suggested 1 T. per cup of whole wheat flour, so that is what I’ve been doing. Hope this one works for you! Ironically the best price I’ve found on whole wheat flour (non-organic) is at Whole Foods. They have a generic for $2.34 / 5 lb bag. Will this recipe work in a breadmaker? Oh my gosh, this bread turned out great. I have been searching the internet for a bread machine recipe that doesn’t turn out so dense, and that my kids and hubby will use for sandwiches, and this is it. Thank you for posting the recipe. I didn’t have honey so I substituted with brown sugar. You are right about the cost savings and the trip over there. I’ve decided we will finish the two loaves we have, and then that is it! Although I will probably still buy their rolls/hamburger buns. I’ve been baking whole wheat bread for about 6 months now. To get bread that is close in texture to bread from the store (so your family will eat it). I suggest to up the quantity of wheat gluten to 1/4c, add 1Tbs Vinegar, ad add 1/4 instant potato flakes (or 1/4c of the water you used to cook potatos in). I diddnt come up with these tips myself, go to http://everydayfoodstorage.net/2009/03/11/making-homemade-bread-the-food-storage-recipe-challenge/food-storage-recipes I am not associated with this blog, but there is sooo much good info in it! Thanks so much for sharing! I finally bought myself a bread machine! I assure you, your bread will be delicious. We got a honey whole wheat loaf from Great Harvest yesterday and my husband and I agreed – mine is better! I encourage you to make your own; you won’t regret it. I use white whole wheat flour in it (with just a bit of unbleached all purpose for softness and sweetness) and it is a winner! I dont have a grinder (yet) but definately is something on te wish list. cool…thanks! I could definitely stand to learn more about the process. Someone gave me a breadmaker and I learned it is great to mix the dough but terrible to bake the dough. So I mix/kneed the dough in the bread maker and transfer it to a pan and bake it in the oven- comes out perfect! You have to use some unbleached white flour with whole wheat flour or it will come out too dense. I’ve heard that you get what you pay for with breadmakers. Friends are telling me it is worth it to spend over $100 for a really good one…could that possibly be a factor with the baking aspect of yours? I’ve printed the recipe and decided to give it a shot! Thanks! I got a bread machine from the Hospice Thrift Store. $5. 17 years old. Worth every penny (and then some) for the tasty bread my ancient electronic makes for me. Definitely make the plunge and buy a bread maker. You will not regret it! Thanks for the French Toast recipe. I will definitely be trying this soon. I have decided to shop for a bread maker this week…thanks for the comment! Before you buy a breadmaker, just try to make it yourself. I bought a good breadmaker but found that making it by hand is really very easy and makes a much more delicious bread. i’ll try to post my recipe soon — i tried sooo many recipes and finally mastered 100% whole wheat bread! only ingredients are: ww flour, yeast, honey, water, yeast, olive oil and salt if you want to include it. I think I am too lazy to do all the kneading and allow time for rising…many have told me I could easily make it w/o a breadmaker, but I just bought one anyway! I had a credit to amazon from a returned xmas gift so it just seemed like the right thing to do. my recipe requires no kneading! Can I get the recipe?? :) Thanks! Lisa, Was just coming over here to tell you that making bread is EASY. Easier than the tortillas you make all the time. I use my kitchenaid mixer dough hook to knead the dough for 10 minutes, transfer to an oiled metal bowl, then sit in the oven (turned on to 170 then turned off) for 1-2 hours until doubled. Then, take it out, punch it down, roll it out, roll it up like a jelly roll, and put in a bread pan to let rise again for 1 hour. Then bake. The hands on time is literally no more than 15 minutes. I’m not kidding. mostly, you are waiting for the yeast to do its magic. You can do it, and if you have a kitchen aid already, you really do not need a bread maker. Good luck! I know so many have told me I can do it w/o a bread maker, but I think what scares me away is how many hours you have to be around for the rising/kneading process. I had a credit to amazon from an xmas return, and it is very tempting to put in ingredients and simply push a button to start it. So I ordered a maker that arrived yesterday. Maybe I should make one loaf in there and one by hand…and save my receipt just in case!! I am impressed you make your own from scratch like that! I’m usually home by 5-5:30, and I’ll mix it up right then to let rise. By 9PM, it’s all done. But, if you want to mix and knead, then leave the first rise while you go run errands, it’s okay if it gets bigger than double. You really only need to be around to catch the loaf on the second rise at teh right time. Good luck, and have fun with your bread maker! I’ve heard it’s great to make homemade jam in there. I also make my own bread and use my Kitchen Aid mixer with the dough hook. I just got it a couple of months ago and I love it! Have not bought bread from the store since. I have been using the bread recipes that come with the mixer. I love my bread maker-but not to make bread lol! For the cost to make a loaf of whole wheat bread I can buy it cheaper at a local bread outlet. I can get a loaf of whole wheat organic bread at the outlet for $1.39. And they have several options, including one with flax seed, one with oats etc. Also, whole wheat is brutal on bread makers, and many can’t handle it. But I do love my bread maker for dinner rolls, pizza crust, cinnamon rolls etc. Definitely a great kitchen tool to own! I finally just got a bread maker yesterday and got excited about all the non-bread things you can do with it. I can’t wait to start experimenting! I use mine for the mixing only. I seem to ‘overdo’ it when I use my Kitchen Aid and I am not crazy about the results when I bake bread in the machine. I’ve heard this a lot from people…about only using their bread maker to knead. I finally got one yesterday and can’t wait to see the results from baking. I hope it turns out good! Meant to add….I do use my Kitchen Aid when I am making my Pita dough…comes out great every time. Do you have a recipe for whole wheat pita dough?? I love pita bread and would love to make my own! I have a kitchen aid and dough hook so I would love to try your recipe! In France we call it Pain Perdu which means “lost bread” it’s not made with the soft bread you have here but traditional bread like a baguette or flute. The reason for the name is that it’s a way to use bread that is too dry to eat by softening it with the egg/milk mixture and then cooking it. We often joke around that “it’s not lost for everyone”. I have very fond memories of my dad making us some, he would butter them right off the pan and sprinkle them with a little bit of sugar. Always a special treat for me. Bread wise, I found this recipe that looks promising for whole wheat. I always have issues with my bread rising if it’s whole wheat in the bread machine. I was going to say the same thing about the cinnamon! And plus cinnamon is beneficial for you! I just love to hear about your meals from a French point-of-view…keep the comments coming! :) Also, I just got a bread machine and am looking for recipes to try. Do you just throw the same ingredients on their list in the machine? Thanks! I tried the bread recipe I linked and totally love it. I only used the bread machine to mix the ingredients since I don’t have a standing mixer. I proofed the yeast in a plastic bowl (somehow it didn’t do as well when I tried the metal bowl of the bread machine at first). Then transfered the honey/water/yeast to the bread machine, added the ingredients according to the instructions, waited 1 minutes, added the rest of the ingredient and used the beggining of the bread program to mix it for 10mn. This bread doesn not need over mixing, the dough is very sticky which is what makes it so fluffy. I’ve had a hard time with 100% whole wheat in the bread machine, most recipes coming with my bread machine ask for so many ingredients and usually the bread doesn’t rise as much and is a bit dense. This one I just loved, it’s barely more hands on and the result is way better. I may try with other flours and nuts now that I’m starting to get the hang of it. On the French note: I think we have a different approche to food (or at least my family did) compare to what I see here. I think part of it is because we tend to eat later and have/take more time to cook in the kitchen. I would love to hear more about your French approach to food…I am so interested in what is different!! sorry if this isn’t new to y’all :) it was new to me! very interesting…never even heard of such a thing! This is so frustrating, because Arnold is the only brand of bread (aside from Pepperidge Farm, I think, at least some of their varieties) they sell at my grocery store that doesn’t have HFCS… I thought it was the best I could do! Especially since every time I make my own in my breadmaker, it’s not very good and Husband won’t eat it. I live in a really rural area, so I will have to do some looking as to where I can get some better bread! Do you use honey for a little sweetener when you make your own bread? Lovely recipe.. i also love to eat real food.. happy to stop by here on your space. I love your blog and ideas…and recipes…and all of it! After watching Food Inc, and reading Michael Pollan’s books, we have changed from being health-food junk-food eaters, to eating more local and fresh…however we are only about half way there. I still don’t have a lot of time to cook from scratch and plan ahead…I really need to work on that! One thing I really need to work on is making my own bread. I love Great Harvest, but I think it would be cheaper to make it myself. I just wondered how it is going for you with your new bread machine, if it was worth it, and what recipe you are using??? Keep this up…it is fun!! Thanks so much for your support! I am loving my new breadmaker. I’ve tried 3 or 4 recipes and am enjoying one that calls for 3.5 cups whole-wheat flour, 1 teaspoon salt, 1.5 cups water, 3 tablespoons olive oil, 4 tablespoons honey, 1 tablespoon yeast (that’s from memory…I think that’s right!). I woke up today with french toast on the brain, and while I don’t really use a recipe for my egg/milk/cinnamon mixture, I wanted to send this idea your way if your family likes french toast :) I essentially made peanut butter/banana sandwiches (whole wheat bread, natural PB, and local honey), dipped them into the egg mixture, fried them on each side in the pan, and then finished them off for 10 minutes on a baking pan in a 350 degree oven. If you and your kiddos like peanut butter as much as we do, they will love this. We drizzled the teeniest bit of pure maple syrup on top, along with extra cinnamon. A good way to pack an extra punch of protein and healthy fat along with a sweet indulgence! Love your idea for french toast sandwiches…thanks for sharing! We tried Claire’s recipe (in the comments up above) in our breadmaker last night. BEST bread we’ve ever made! The bread is soft and light, and the crust is soft too. Thank you Claire! 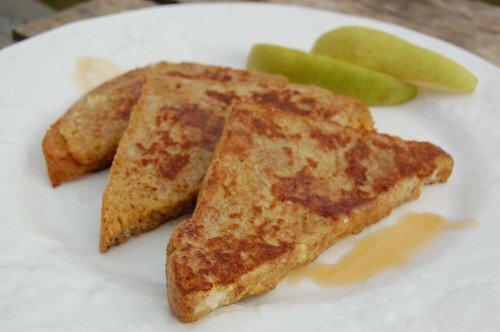 The whole wheat french toast is a new approach and modern way to stay healthy and eat your favorite food at the same time! Thanks for sharing this quick recipe for everyone to try! Breakfast will never be the same ever again! Any luck freezing and reheating? Thanks Amy! At what temp and a out how long do you reheat in the oven? I have had great results with putting them in my toaster straight from the freezer, just make sure to cut them to a size that will fit in the toaster before freezing them. Love your recipes! I would love to see a French toast casserole recipe! Seems like it might be easier/faster, especially if you can make it the night before. I’ve tried googling for one but they all have sugar or other unhealthy ingredients. Thanks! Love your website and your passion! 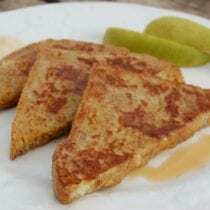 Do you have a french toast caserole recipe that could be made prior to a large gathering? (Maybe refrigerated overnight and baked the day of)? Also, we do not have a great harvest where we live (although I LOVE great harvest!). Do you have another recommendation for whole wheat bread, short of making your own? Thanks! Use the french toast recipe as a challenge for you to create – I see that other readers would like one as well! Can I make a huge batch of this and freeze it? Does it thaw well? Lisa- I frequent your recipes regularly but have never left a comment! I’ve been making this French toast for at least 6 months now, and it has become a favorite for my kids and I. I made it this morning and it took less than 10 minutes from start to putting it on our plates. I just wanted to say thank you for all the great and easy recipes and thank you for paving the way for many of us to learn how to prepare real food in very do-able ways. I made this recipe not too long ago. I thought I knew how to make good french toast before, but after making this, I realized i’ve been doing it all wrong! This was absolutely wonderful. I followed the recipe exactly, and they came out delicious. Thank you so much for the inspiring recipes! I make your pancake and waffle recipes and freeze them and it’s so nice to just pop in the toaster in the morning! Have you frozen the French toast? Any reason you shouldn’t? This is the same way my mom made French toast for us when we were little! I make it this way for my kids as well. I just use eggs, skim milk, vanilla, cinnamon, and nutmeg. Yum! FIVE STARS! Love, love, love that it’s healthy and delicious!! 1. Proof yeast, honey, 1 C water, butter 10 minutes. 3. Knead 10 minutes until no longer sticky. On floured surface. 4. Oil bowl, rise dough covered, in warm area 1 hour. 6. Make 2 loaves place in 2 oiled pans. 7. Rise 30 minutes in warm area. 8. Bake 350* 40 minutes. Wheat is a grass and is not easily digested by a human body. Grasses are good for cows and animals with the kind of stomach to digest it. A better choice would be to make your own bread using nut flours–almond, coconut, etc.